Life satisfaction and fulfillment are not granted for us on a silver plate. We have to work hard at first to relax later into living life the optimal way. On a personal level, we need to socialize, have a romantic partner, grow intellectually, etc…. On a professional level, we need to have congruent relationships with our superiors and colleagues, we need good working conditions, we need to enjoy our vocation, etc…. In some instances, we focus on specific life areas at the expense of others. This becomes highly pronounced for those who join the working force. Striking a balance between our personal and professional roles can become cumbersome especially if we desire to keep progressing on both life areas. Both encompass multiple aspects; and dissatisfaction with any one area can negatively impact life fulfillment in general. The good news is that we have options, we can make choices, and we can decide to make things work better for us. STRIDES previously Coaching Ur 3Ps (your Personal and Professional Progress) model brings all of your life aspects to the spotlight. 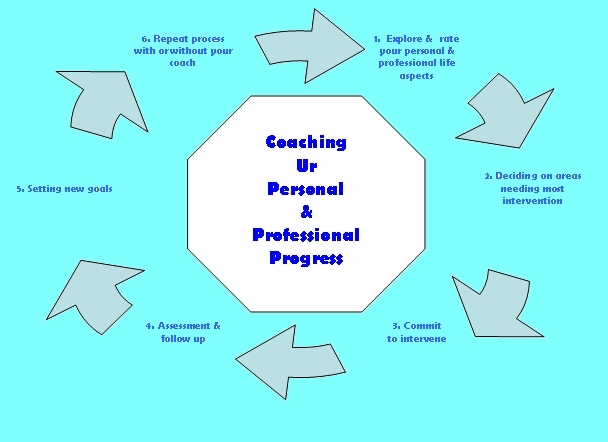 The coaching intervention provides the basis for examining closely the different aspects comprising your life. These feed into your current identity. But sometimes, your aspirations are not in line with reality. Once you compare your “perceived self” (i.e. what you believe constitutes the person you actually are) with you ideal self (i.e. what you truly aspire to be), a certain realization comes to the forefront. “Do I want to continue the rest of my life this way, or shall I opt for change and move forward to effect positive change towards my ideal self? Is it safer to stay in my comfort zone? Or shall I seek new avenues towards fulfillment? What do I want to improve now and what can I postpone to enhance later?” The answers to these questions and many more will be unleashed during your coaching process. Your coach will partner with you your journey of 3Ps. Your coach will help you toy around with different perspectives, explore how life works best for you, clarify & identify your most fulfilling goals, & enable you learn the multiple paths to becoming your own mind-Guru. Your coach will empower you to achieve what your heart truly desires, move you forward, think “outside the box”, & seek opportunities in your life circumstance. Based on your own strengths & skills, your coach can co-create with you the steps needed to be the “progressed self” you yearn to be. Along the process, you will learn that you have so many dormant competencies that were suddenly galvanized. Your personal and professional life encompasses several areas. Satisfaction on each varies to a different extent depending on your circumstances. As a coachee, you need a map that guides you to deficient areas that if rectified can bring you better life fulfillment. Rating how satisfied you are on each of these areas can clarify where you need to progress. Give a score for each using a scale from 1 to 10 (1 meaning lots of progress needed in this area, 10 being perfect, it can’t get any better, 5 some progress needed & so on). Is there a room for your intervention on any of these? What did you score least on? Which areas seem deficient and present as key to focus on in order to progress? Decide which of these areas you want to improve. You can tackle more than one area and work on it in parallel with others. Try to prioritize according to the relevant scores you gave each. Clarify your ultimate goals and work backwards by setting the mini-goals to be there. Once you decide to effect some change, committing to the process is vital to your progress. Your word binds you. Promise yourself you will and you will; Believe you can and you can; expect to progress and you will. Your coach will be there for you as you set your goals (big ones; and smaller ones); will give you feedback along the way; will enthuse you to get things done; and will acknowledge your step by step achievements. Nothing can stop you when you commit. You can explore and utilize different strategies once you are committed to the process of progressing (be it on personal level, professional level, or both). Along the way, some goals are achieved; others are not reached. Assessing how far you are away from your goals and the strategies utilized to achieve these is imperative to the whole process. When mini-goals are achieved, they serve the bigger goals. You’re on the right track of progress. Celebrate your accomplishments; it energizes you to expand your horizon. Enjoy the taste of achievement (stagnation tastes sober L). When your goals are not met, we explore why. Nothing can be termed “a failure”; rather unsuccessful attempts that require revision and the adoption of different means to achieve those unmet goals. You can be working on parallel goals; others require more focus. When certain goals are achieved, it is time to shift focus on rectifying other areas that can add to your life fulfillment. Explore what is the most pressing need again. You need fulfillment to snowball. You need to strike a balance on all. You need to be the “ideal you” your heart aspires and you deserve it. 6. Repeat process with or without your coach. Your Personal & Professional Progress defines you. Why not give it all the attention it desreves? Welcome to STRIDES (previously Coaching Your 3Ps!!) Your personal and professional progress define how eager you are to live your life to the fullest. Do you want to learn how to optimize it? just continue reading and learn about 3D's mission. I love what I do and that's what makes the journey more interesting for me and for those I interact with. Time For Your “Mind Gym” – What Are You Certain About? Time For Your “Mind Gym” – How “Mindful” Are you? Time For Your “Mind Gym” – How “Happy” Will You Make The Coming Year? Time For Your “Mind Gym” – How Well Have You Fulfilled Last Year’s Self-Promises? Time For Your “Mind Gym” – How Heavy is Your Emotional Baggage?